I used to make pirate maps as a kid more or less with the same aging process. I think this issue is a great homage to the classic era of comics. It took me a while to find this one, but I am really happy I did! Its funny you post this one because a couple of weeks ago me and my brother went to a comic shop and this was one of the comics he was looking for to finish his set, so he pulls it out and looks at and says wow its in crappy condition so he didn't buy it, then when we got home and he looked at my set and pulled out that one realizing thats how the comic was published he threw out a couple curse words and I was just sitting there laughing. I remember when I finally found #15 in a back issue bin at my local comics shop. I had to ask the guy at the counter if the cover was supposed to look beat up, or if it actually was beat up. Man, I was going to put in a joke about how I always thought I my #15 was in crappy condition, but I was beaten to it. I always liked this cover as a homage to the old-school comics. I believe the issue is even a little smaller than the standard size for a current comic book. -->> one of the more brilliant covers. Metal Head remains the perennial favorite too. amazed at his B T T S redesign..
much more mature like he actually is. Are we gonna see more of S.S. Steve and the gang in the comics soon ?? I loved this issue when it came out, still do. This is how most of my comics ended up looking anyhow, so it was very proper to have a comic about comics look like a comic. Comic. I particularly dug all of the comics on display in the shop too. I love this cover. 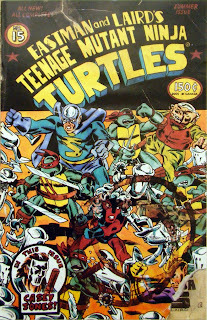 I found a copy of TMNT #15 a few years ago in my local comic shop. I got it because I love the cover a lot. It really looks like a golden age comic and the story was great. It turned into one of my favorite subplots in the TMNT 2k3 show. Oh, cool, is that the original Silver Sentry? 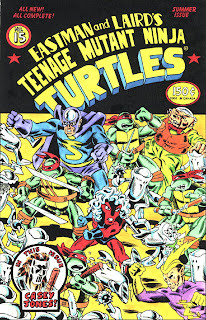 Bought a bunch of vintage TMNT comics a few years back and they were all bagged. I assumed for the longest time that this comic was beat to crap... Until I got it out of the bag and realized what you had done. Truly brilliant and probably one of the most unique comic covers ever. Stands out even today.